How to Transfer iPhone/iPad/iPod SMS & MMS & iMessage & WhatsApp Messages to Windows Computer? 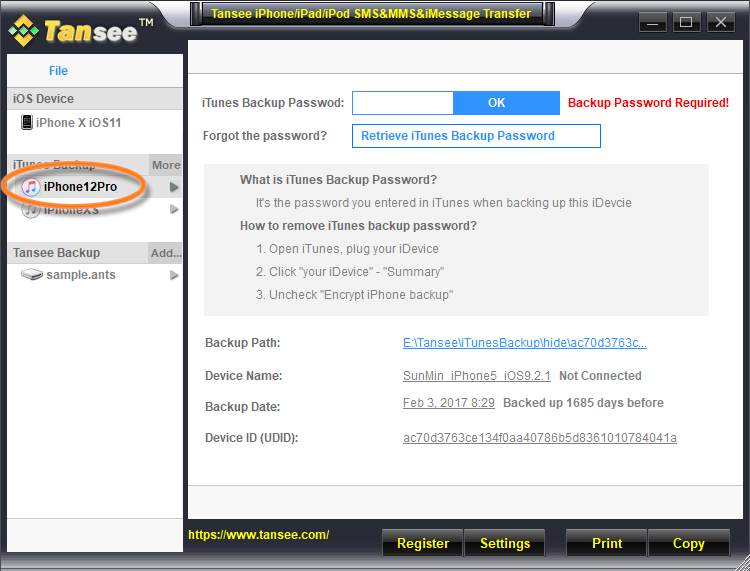 How to Backup iPhone/iPad/iPod SMS & MMS & iMessage & Whats App Message & Deleted Message to PC? 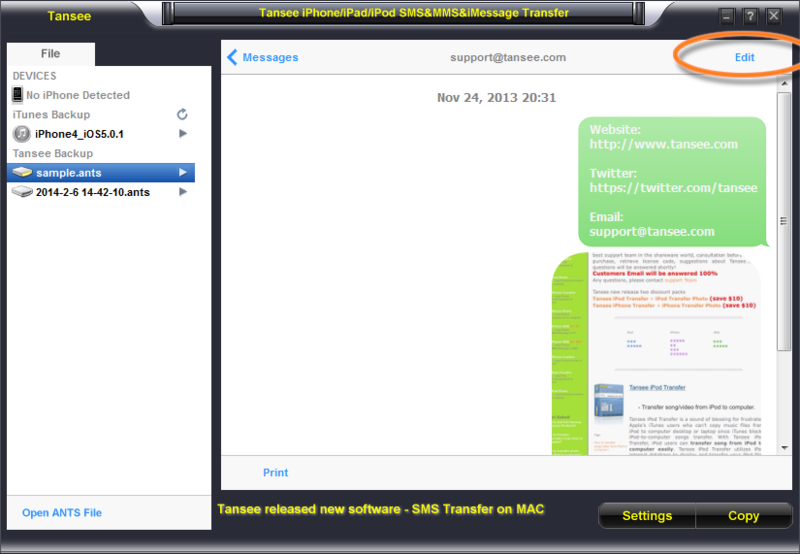 Download and install Tansee iOS Message Transfer free version here. And please install the latest version of iTunes, make sure iTunes can read your iPhone/iPad/iPod. 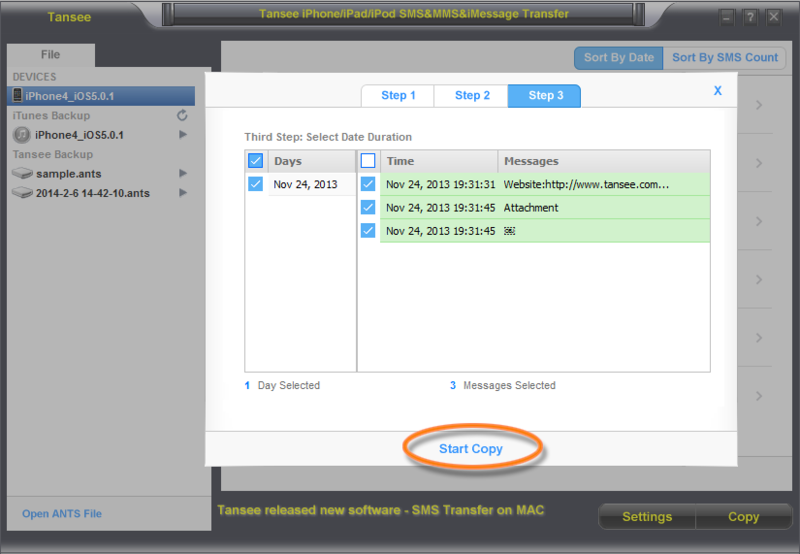 Run Tansee iOS Message Transfer. Click the button labeled 'Copy' which can be found at the bottom of the screen. You can choose to copy all your iPhone/iPad/iPod messages to your PC to ANTS or HTML or TEXT or PDF or JPG format. 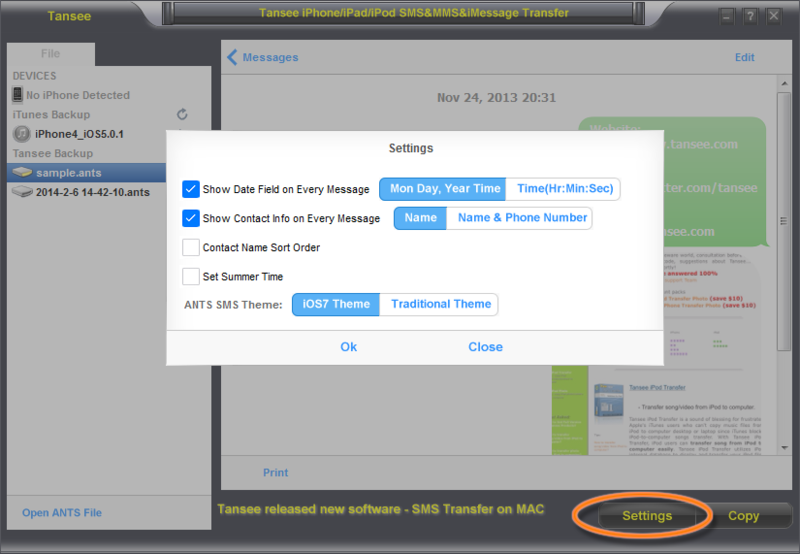 You can set password to protect your SMS&MMS&imessages database for personal privacy by choosing .ANTS format. Select the contact from Tansee contact list. And then click 'Start Copy'. Select the messages by date. And then click 'Start Copy'. 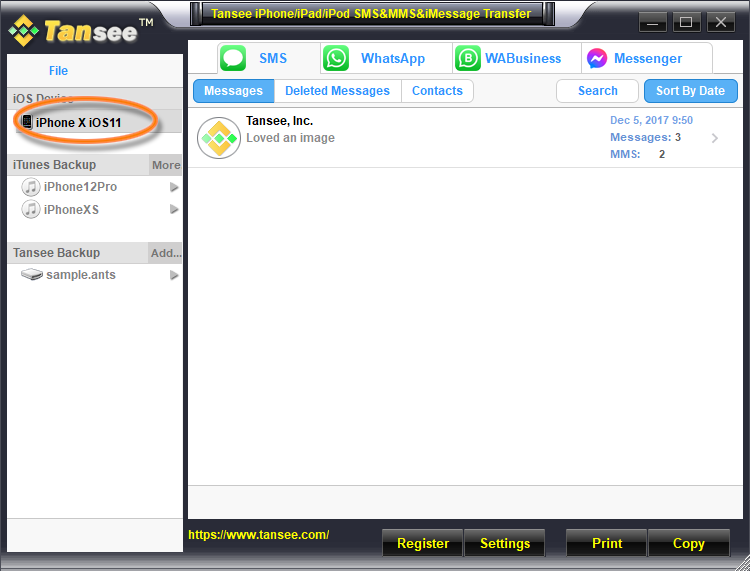 Free version can display ALL deleted messages have been found by Tansee. Please upgrade to FULL version and restore Deleted messages. a, Click the button labeled "Print" which can be found at the bottom of the screen. b, Copy SMS&MMS&iMessage to .html file format. And open the .html file by Chrome or IE 11+ or Firefox or Opera or Safari 5+, and then print. c, Copy SMS&MMS&iMessage to .pdf file format. d, Copy SMS&MMS&iMessage to .jpg file format. And print the picture. Settings: help you print messages out and have them be seperated by date and 'sender' and 'receiver'. 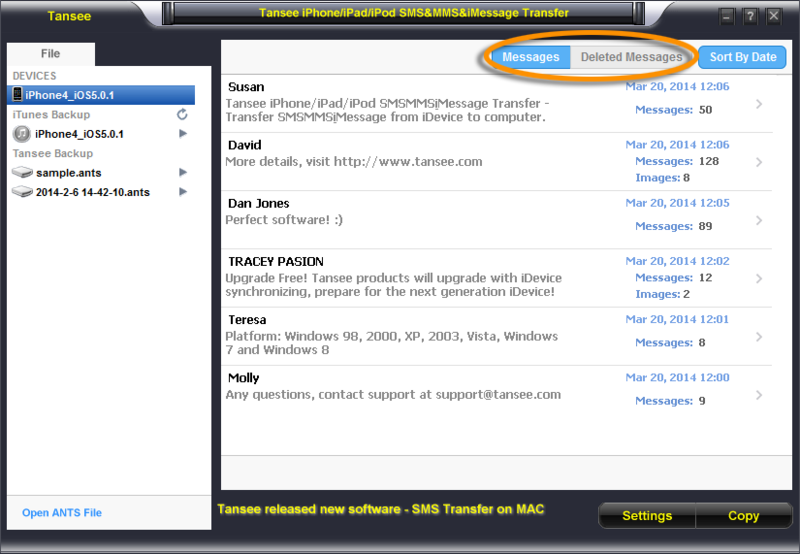 Tansee iOS Message Transfer can automatically read and display all your iTunes backup Messages and deleted Messages. Edit Messages: Open ants file, and click Edit. Click the single contact, and then click Edit. How to Transfer Song & video from iDevice to Computer? How to Transfer Photo & camera video from iDevice to Computer? How to Transfer SMS & MMS & iMessage from iDevice to Computer? How to Transfer Contact from iDevice to Computer?